National health security improved during 2016, but at a sluggish and uneven pace across the United States, leaving some states and regions with significantly fewer protections than others. 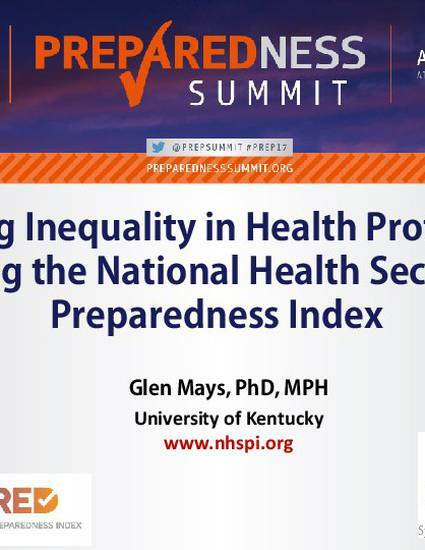 Results from the 2017 National Health Security Preparedness Index show that gains in preparedness for disasters, disease outbreaks, and other emergencies occurred in each year since 2013, but current levels of health security remain far from optimal. The national Index reached 6.8 out of 10 in 2016, representing a 1.5% improvement over the prior year and a 6.3% improvement since 2013. Nevertheless, large differences in preparedness persisted across states, and those in the Deep South and Mountain West regions lagged significantly behind the rest of the nation. If current trends continue, the average state will require 9 more years to reach health security levels currently found in the best-prepared states, and 20 more years to reach a strong health security level of at least 9 out of 10.